It's a dynamic word; it's a word that practically all of us have experience with. We're afraid of public speaking. We're afraid of spiders and heights and drowning and car accidents and terrorist attacks. We're afraid of loss. of shame. of defeat. of rejection. We're all afraid of something. What if fear isn't all bad, though? Life will give us things without our asking. What it gives to us is not always in our control, but how we respond is. What we do with the emotions we have and what we aim them at we can make an effort to control and direct. 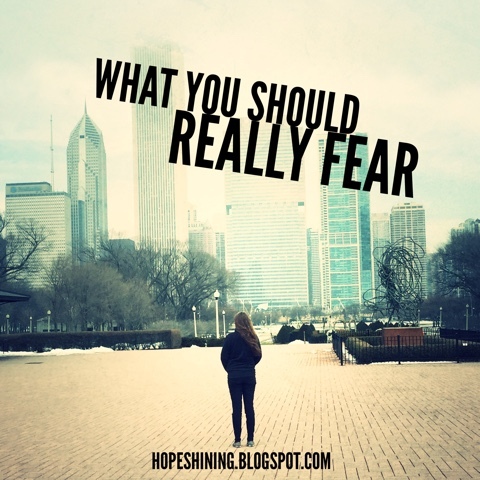 We fear (and maybe, we just need to learn to fear the right things). You don't need to necessarily fear physical blindness but fear the blindness that reaches beyond that. Fear the blindness that prohibits you from seeing what is in front of you clearly, from seeing others for what they are, for seeing yourself for who you are. The true frightening reality is when we live in a reality of poverty, oppression, and injustice and we no longer see it. It's scary when you only see others from the lens of what your projected judgement is putting on them. Life is drenched in fear when you no longer can see and refuse to admit when you've done something that has hurt others and cannot see that you may need to make a change. Safety isn't always something that is bad; it has its place. We often need to be safe from the elements, from gunfire, from hunger. But clinging to safety like it is oxygen you cannot function without is not healthy, either. "A ship is safe in harbor, but that's not what ships are for" (William G.T. Shedd). If you ever want to make a change in your life, to feel like you are doing something of meaning and purpose try danger. Don't try careless recklessness, but try small acts of dangerous living. Do something outside of your comfort zone. Talk to someone who you've been meaning to but are too intimated to try. Reach for that goal you've been too afraid to try because it could go not as planned. Keep the fear of ebbing out a "safe" existence ever in front of you and have the courage to live life on purpose. "What would life be if we had no courage to attempt anything? (Vincent van Gogh). "The more often he feels without acting, the less he will ever be able to act, and, in the long run, the less he will be able to feel" (C.S. Lewis). The world is brimming with hurt and pain. We notice these things in others; we've felt them ourselves. The frightening reality comes when we stop acting when we are moved to act and when we become so cocooned in our self-centerdness that we no longer even feel these things. It's only when we act that we gain momentum and that we can (as strange as it sounds) ensure a higher chance of acting in the future. It is action that changes the future. We must go. We must do. We must fear a permanent stopping. If we are fearing blindness, safety, and inaction, we still can undo the good that these three fears produce with one simple habit: laziness. "Laziness is exactly as the number eight. If if lays down, it becomes infinite" (Anonymous). We must fear this laziness because it causes our lives to be full of the other three. As we sit and neglect productive work, we can become blind to the potential that we have to do more with our lives and lose sight of the impetus to actually do it. As we drown in our indifference, we live lives that are too safe because we never go out and find what we are capable of. As we procrastinate without fail, we are inactive in many areas in which we need to be taking action and making a difference. Fear laziness because of the havoc it can unleash into your life. Fear has power; it has the power to immobilize you or to send you soaring. It has the potential for both. You choose which potential becomes a reality. This post was originally seen on Brave Mag.